Film on stage was a project initiated by Odeon Theatre in Bucharest and coordinated by theatre director and playwright, Andreea Valean. 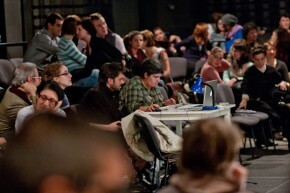 It aimed to promote a dialogue between theatre and film professionals in Romania. The idea for this project came from two different directions: Alexandru Dabija, a mature and innovative Romanian theatre director; and Corina Suteu, a successful cultural manager, currently working for the Romanian Cultural Institute in New York. This connection between a stage performance and film making proved to be very fruitful for the screenwriters who got in touch with many, different kinds of theatre actors and learnt to develop their lines and characters. It was also fruitful for theatre lovers to get a glimpse of how film shooting and production happens. This programme was opened to the audience to get acquainted with the kitchen of script development and basic elements of producing a movie. Andreea Valean is an award-winning playwright, producer and scriptwriter as well as an established theater director. She graduated from the Theatre Directing Department at The Academy of Theatre in Bucharest. She is the current Project Manager for dramAcum contemporary theater project - a leading group of young directors working on contemporary plays. Her work relates both to theatre directing and screenwriting. The film The Way I Spent the End of The World, which she wrote and produced, was selected for the Cannes Film Festival in 2006. Two years earlier, the short film she scripted entitled Traffic was awarded the prestigious Palm d'Or at Cannes Film Festival. The film based on her play When I Want To Whistle, I Whistle was selected for the Berlin Film Festival's official competition. Razvan Radulescu is a screenwriter who was invited by Andreea Valean to work during the first evening of this project. He is among the most dynamic screenwriters, and is linked to almost every Romanian movie that have won prizes in famous film festivals around the world. Radulescu studied Literature and Opera Directing in Bucharest. He wrote two novels and worked as an art director for magazines. In 1999, he started to write for films, among which includes the award wining “Stuff and Dough” (Cristi Puiu), “Niki and Flo”(Lucian Pintilie), “The Paper will be Blue” and “Boogie” (Radu Muntean) and the internationally acclaimed “The Death of Mr. Lazarescu” (Cristi Puiu). He also worked as a script consultant for Cristian Mungiu’s “4 Months, 3 Weeks, 2 Days”. In 2009 he wrote and directed his own movie together with Melissa de Raaf – “First of all, Felicia”. Dana Bunescu combines her editor and sound skills for most of her projects, working along the years with some of the most important Romanian directors: Cristi Puiu (sound and editor for his short film “Cigarettes and Coffee” and editor for “The Death of Mr Lazarescu”), Alexandru Solomon (sound for The Great Communist Bank Robbery), Cristian Nemescu (sound editor for California Dreamin’), Cristian Mungiu (sound and editing for “4 Months, 3 Weeks and 2 Days” and “Tales from the Golden Age”). Her most recent project is the famous “Autobiography of Nicolae Ceausescu” directed by Andrei Ujica. Three days of casting were necessary for Razvan Radulescu to assess around 130 professional actors and actresses. The manner of the casting was unconventional. The actors weren’t asked to prepare to say a monologue, to read some lines or to do physical work, or simply to act. They were asked, before they entered the casting room, to read a summary of some scenes and situations, to memorise the characters’names and their main features and to think about the social status of the characters and their situations. The casting process was in fact a dialogue between the actors in the same room about elements presented in the summary. Razvan Radulescu was interested to observe how the actors behaved in a given situation without having memorised the lines, being forced to create a real conversation between themselves, to react, to present and to carefully listen to each other’s arguments. During those three days of casting various scenes were created: sometimes humorous, even ridiculous, but always rich in natural lines and authenticity. The full casting period was filmed by a young camera operator, Adi Bulboaca. On the fourth day, Radulescu revised the video tapes with the actors he was interested in and chose four actors and four actresses, creating four couples for his script: Oana Rusu and Virgil Aioanei; Alina Berzunteanu and Andrei Fantana; Irina Draganescu and Andrei Necula; and the last couple who were the youngest among them: Diana Croitoru and Andrei Hutuleac. The rehearsals on Odeon Studio’s stage took three days. Radulescu intended to recreate on stage a scene from the script he was currently working on for his next movie. But he recreated the lines of the scene together with the actors, in connection with their personal stories. No lines were memorised; the actors had the power to invent whatever they wanted for a situation lasting 15 minutes. The entire rehearsals were filmed by Adi Bulboaca and the actors were able to see fragments of the scene on the screen. Radulescu showed them different angles of shooting a scene and the way they were perceived as presences through the filter of the camera. On 2 December, the team working on this project showed the audience the small 15-minute scene [the usual theatre manner] but being forced all the time to cope with the presence of the camera on stage. The scene was shot in different angles as directed by Radulescu and the actors performed the scene again. The audience had the chance to see the process of shooting a scene and to observe what was interesting from Radulescu’s point of view and why it was necessary to shoot again. After a break of 15 minutes, the audience came back to see the process of editing made by Dana Bunescu. This step was a little boring for the general audience that had came to see a performance, but nevertheless was the most fascinating for those who were interested to see how the video fragments were being cut and background sounds, such as dog barking and the noise of the TV, were added to complete the scene. And, in the end, the final credits were added to this short film. Theatre and film have once again proved to be interconnected: actors who gain different acting experience in film and theatre, learning to react to the presence of the audience while on stage and of the camera in front of and between them, to the director and screenwriter, giving the leading rules on the stage and for the camera. Even if the evening of 2nd of December 2010 was misleading, being somehow boring as the process of cutting and editing is time consuming and difficult, experiencing these double levels of theatre and film was very rich and fruitful not only for audience but also for actors, director, all the team involved. Disclaimer: Florentina Bratfanof was the assistant of Razvan Radulescu from the producer’s part: Odeon Theatre.